Wedding movies are so fun. They unite an audience because everyone has wedding experience, either as an attendee or a participant. So when various antics, disasters, and human foibles are projected on the big screen, well, it can be delightfully entertaining. DJ Delights gets a big kick out of wedding movies, because we’ve seen it all in real life! When you entertain at wedding celebrations on a weekly basis, you can’t help but encounter some zany escapades that fall into the ‘truth is stranger than fiction’ category! I couldn’t help but laugh at a recent wedding ceremony that was held on a Sunday afternoon. The poor priest officiating the service kept referring to it as a funeral instead of a wedding. That got a ton of laughs. He explained that he almost never performs weddings on a Sunday, and that funerals are more typical on Sundays, so it was tough for him get his mind out of funeral mode and into wedding mode. Wedding movies are so much fun! There’s money in wedding movies! The risk of watching movies like these is that most brides don’t have Hollywood budgets! Some brides get a little overwhelmed and fret that their wedding celebration will pale by comparison. Your wedding can be better than a Hollywood movie! Don’t worry, your wedding can easily exceed any you see on movie screens, even if your wedding budget is on the ‘normal’ side, which is most of us. Everything depends on the entertainment. If your guests are having fun, they aren’t even going to notice if your reception is a buffet or a sit down dinner. DJ Delights offers a rich selection of entertainment options with attractive package pricing. DJ Delights’ photo booths. Entertainment provides 90% of the fun at wedding receptions, but only costs 10% of the typical budget. 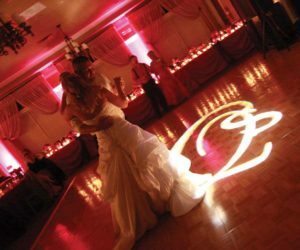 Just as a good Hollywood wedding movie provides you with great entertainment on the silver screen, DJ Delights will provide you with fabulous wedding entertainment, defined by packed dance floors, flawless MCing, and a spirit of fun. It’s your turn. Your wedding CAN be better than a movie. Start planning your dream today.